Yellow was the prompt for the first Art Challenge in June. 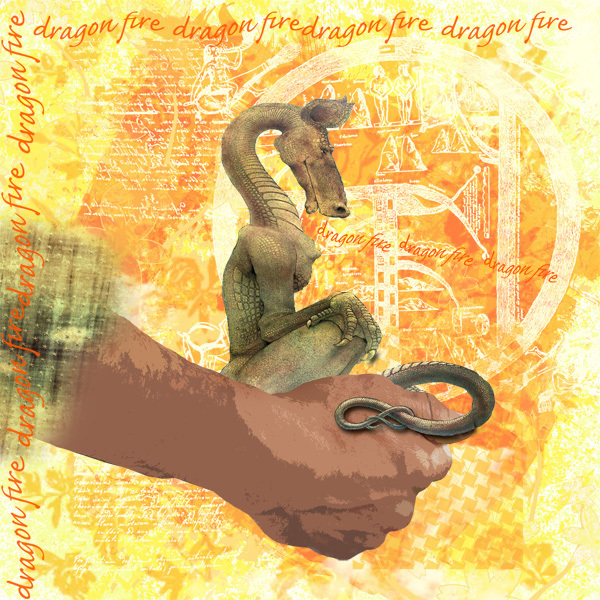 This dragon and hand image is the one I created for my fabric collage for the Arts for the Creative Mind Yahoo Group. I so love how the little dragon sits in the hand so beautifully. I can imagine that little tail curling around my own hand as I walk through the sunflowers. Imagine, Invent, Create was the prompt for July. I chose Joy because that is where I go when I am creating, inventing and imagining. The silhouette is one I created from a magazine ad. I loved this silhouette because she runs with sweet abandon. I would love to just let go and run through a field of butterflies, daisies and buttercups. 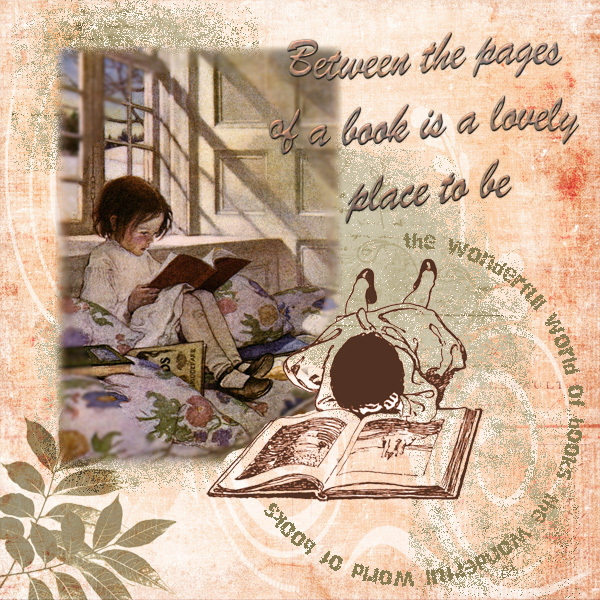 Books is this month’s prompt and as soon as I saw it I thought of the old Book of Poems by Robert Louis Stevenson and the images of children absorbed by the wonderful stories in their books. That is how I remember feeling when I first learned to read. I haven’t put a book down since. I love reading and feel books are always going to be around, even if they are published digitally. This little kit was created for another challenge. 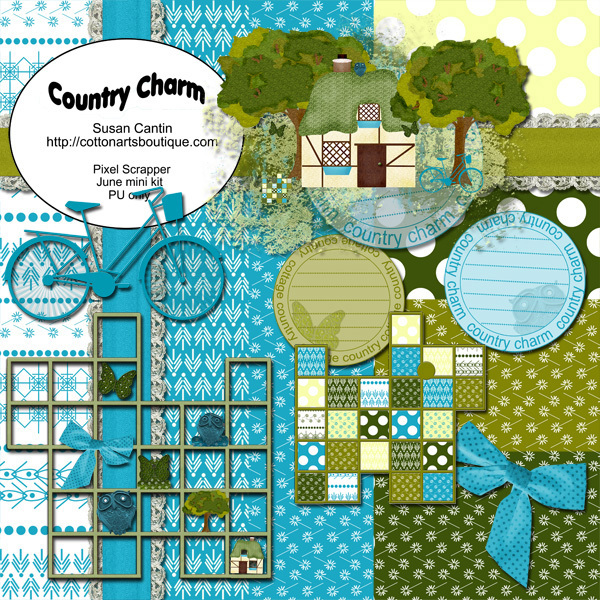 I wasn’t quite sure what I wanted to do until I came across the vintage pattern for the little cottage. I redid and adapted it for digital and then the rest of the kit fell into place along with the choice of colours. For the frame I created a scottie dog block pattern from a another vintage quilting pattern with lots of little squares to fill with your favourite snaps. 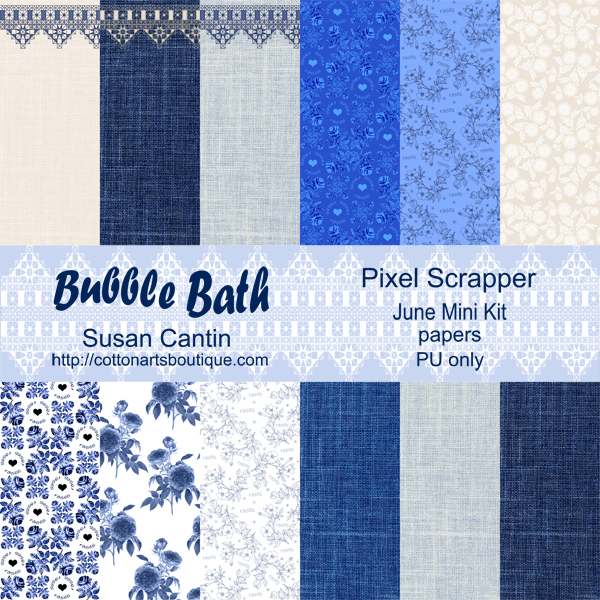 This little basically blue kit was created for a Pixel Scrappers June challenge …. the challenge included the colour blue and bubbles. The rose and sunflower papers remind me of vintage wallpaper. 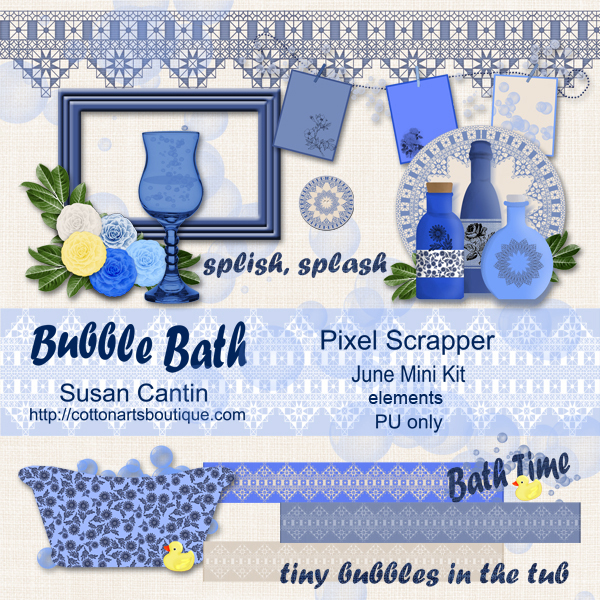 I included some blue glass bottles and three lacy ribbons. The lace and bottles were created especially for this little kit. Watch out for the ghosts and goblins tonight. I kept these three photos aside just for tonight’s festivities. All of these photos could be used as backgrounds for a spooky digital collage or inspiration for a dark nighttime quilt. A summer moon taken on a hot night. The white cedar shadow gives this photo it’s Halloween flavour. 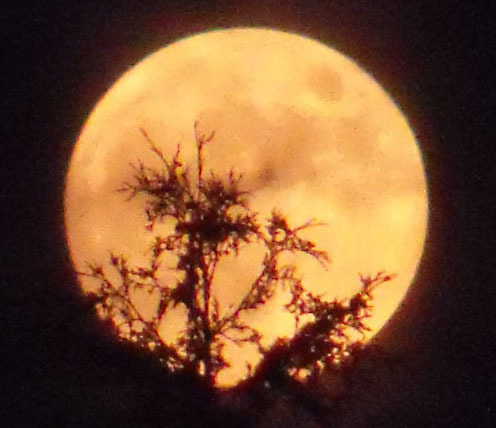 September gives us a different moody moon. 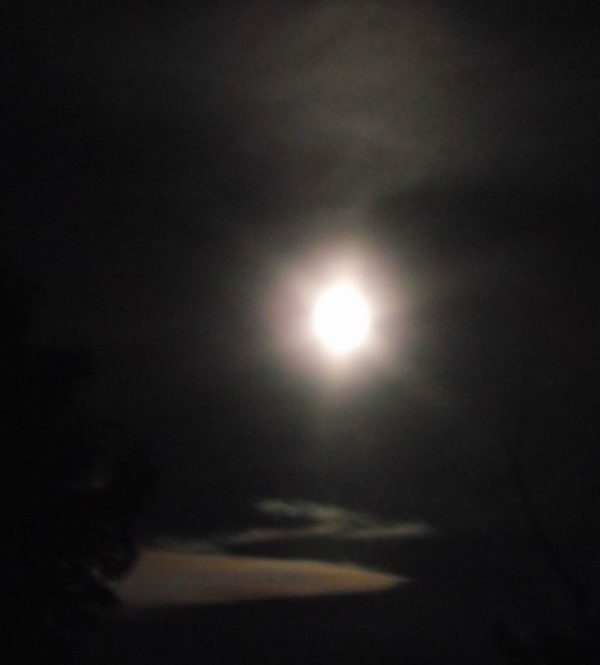 The moon this night was a beautiful silver with a big dog ring that picked up the moon shine and through it around the scudding clouds below it. This is another summer moon. 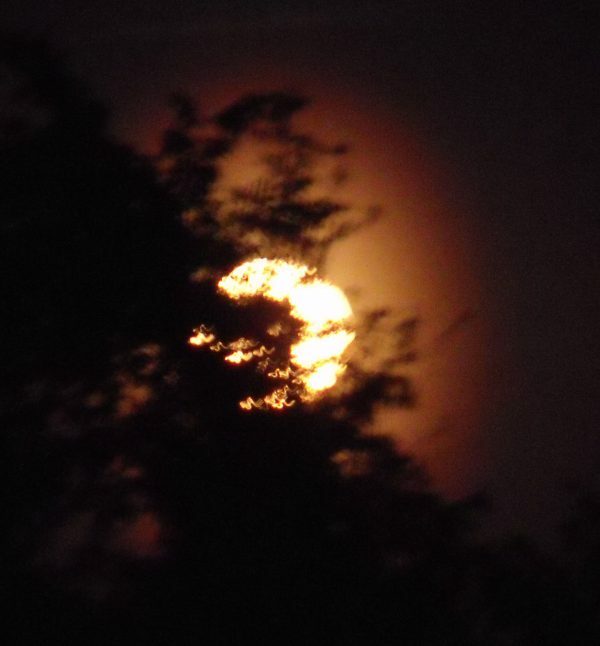 A June moon which was taken on a hot evening and another shadow of a white cedar tree. This vintage pattern was published in the McCall’s 1977 Needlework Magazine. They used it to paint ceramic tiles…it even has a fire hydrant and a little dog. 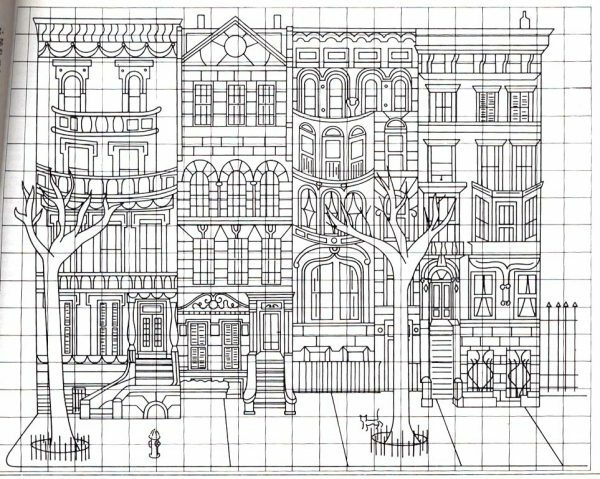 The city dweller on your gift list would be happy to receive a creation made with this pretty pattern. 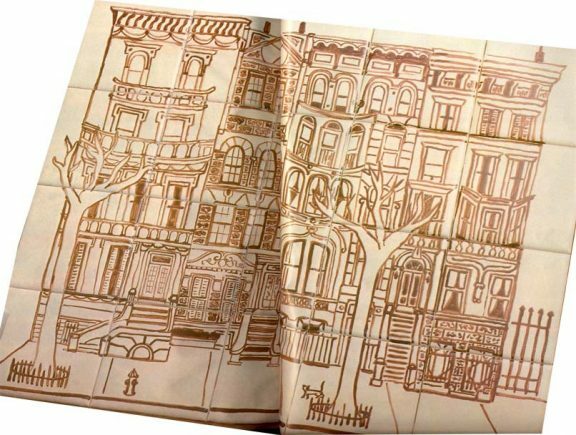 These brownstones would be very sophisticated painted onto a silk scarf. As a pillow top they would set off a white couch or could be done in bright colours as well. Embroidered onto linen and stretched into a frame could be another way of creating your own masterpiece with this pretty pattern. A whole cloth quilt of ecru cotton with the brownstones embroidered in bright white would make a lovely spread for a bed as well.